It seems neighbors are building a long gutter made of split bamboo for 流しそうめん ( nagashi-soumen ). 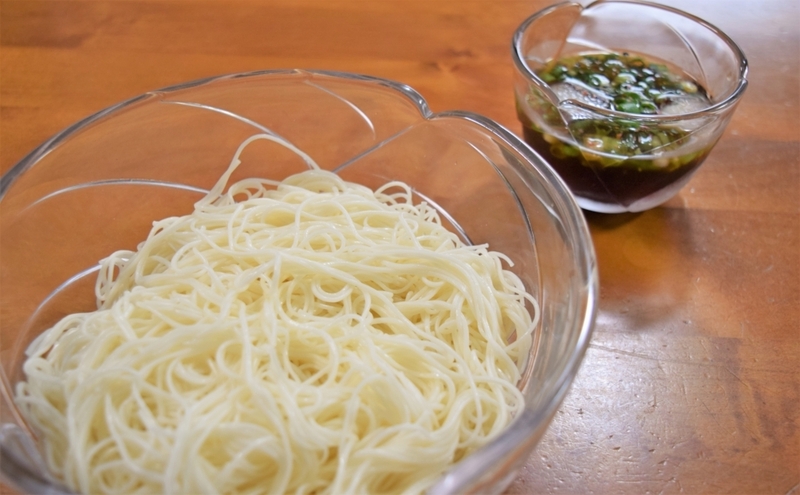 そうめん ( soumen ) are very thin noodles made from wheat flour. These are sold in supermarkets as dried noodles, and they are very common food during summer. You can cook it with no difficulty: boil them in hot water, wash and soak in cold water, drain off the water, and finally, serve along with diluted Japanese noodle dipping sauce. The sauce can be well-seasoned by spices according to your preference. The slippery noodles go down smoothly into your throat. We have an entertaining method of eating these noodles. This is one of our summer traditions. Put soumen in water flowing along a long gutter, which is made of bamboo split into a half, and you try to catch the noodles by chopsticks and eat it while it's going down or floating in the gutter. No need to worry about wasting the noodles. The gutter has a strainer or a pool to stop them from falling down at the end. We generally don't have the gutter in family houses, but if you go to restaurants, the countryside or events for it, you can still enjoy this tradition.